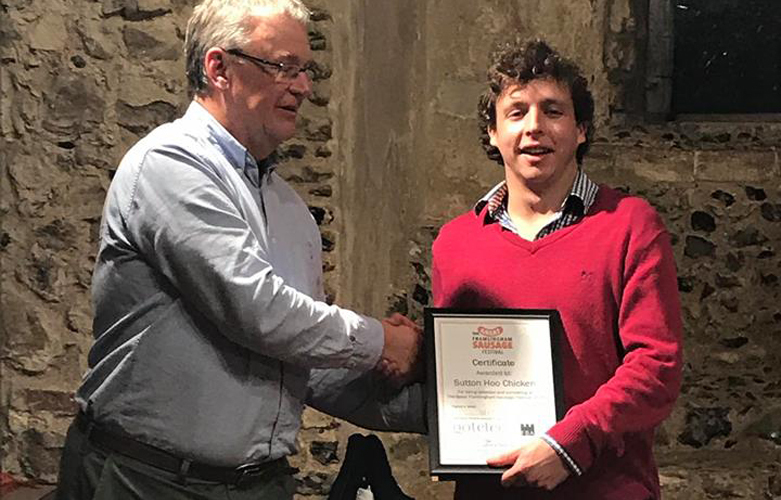 The team at Sutton Hoo Chicken is celebrating after picking up the award for the Best New Taste Sensation Sausage at the Framlingham Sausage Festival. Sutton Hoo Chicken, which is renowned for its high welfare, free range chickens, received a resounding pat on the back at the weekend for its latest incarnation, Chicken Sausages, fighting off stiff competition from a range of high profile producers. The Sutton Hoo Chicken Sausages are a delicious alternative to regular pork sausages, bursting with flavour and much lower in fat. They are available in two tasty flavours: a regular sausage with a classic Cumberland seasoning of mixed herbs and spice and Smoked paprika & Chill, a spicy sausage with a gorgeous, distinctive flavour. Both sausages are gluten free, with a high meat content and natural casings. Now in its eighth year, The Framlingham Sausage Festival celebrates sausages from across the region and saw over 10,000 visitors across the weekend. Alongside the awards, the event included comedy and children's entertainment, live music, beer, cider and a variety of workshops to appeal to all the family. Great Taste Award Winners 2018!